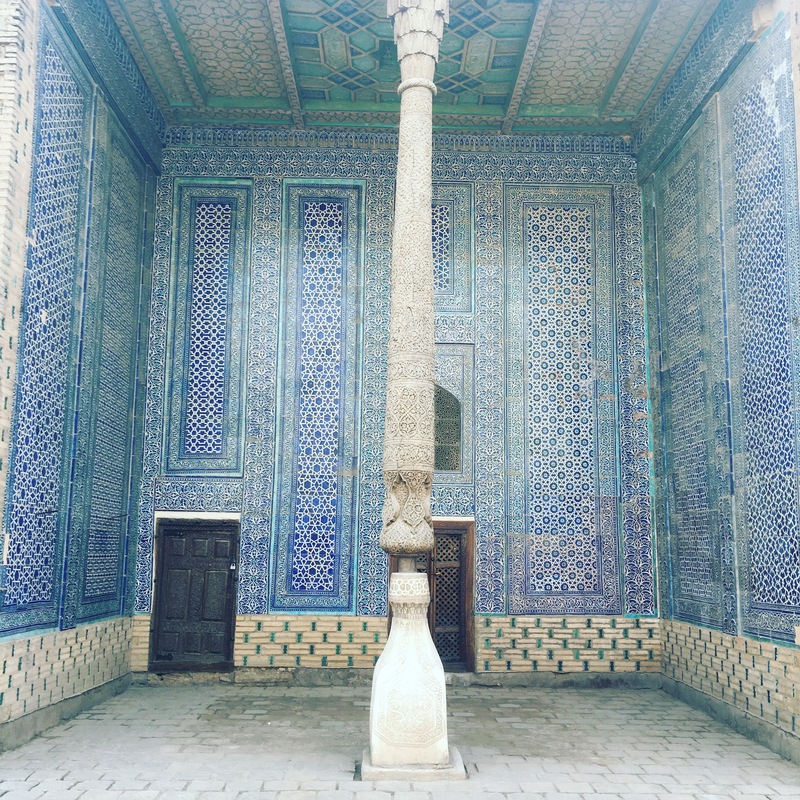 When I asked my guide if Uzbek language is ancient, he defended it vociferously and explained (with futility) the difference between the more simple English and complex Uzbek – one required a dictionary, the other had no experts. “It goes deep” is all he could tell me. I believed him. 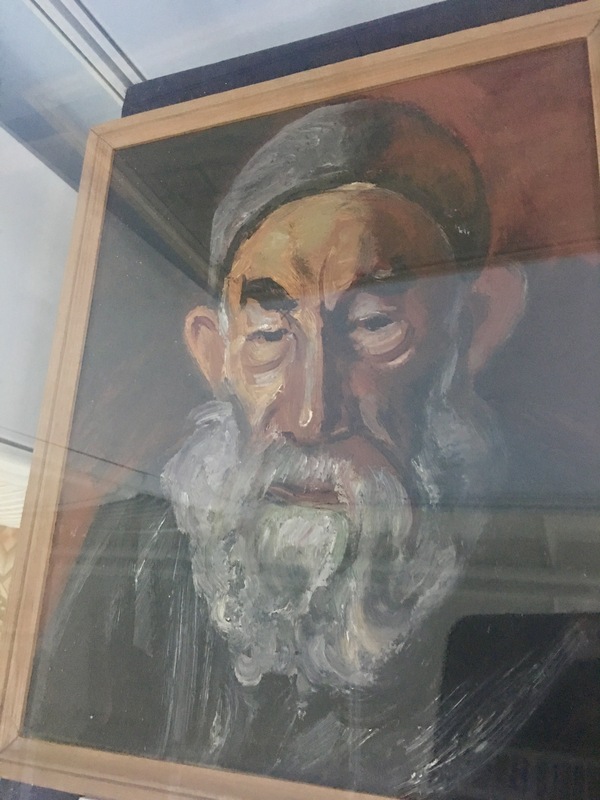 He was an expert in languages and speaks Farsi, Uzbek, Russian, English and Turkish fluently, and understands Hebrew as well as Yiddish well (I thought they were the same but apparently they are not) to be able to draw comparisons. I had thought that for a language to borrow its vocabulary from Turkish and script from Latin (and previously) Cyrillic, there may be little that is its own. But during my journey, I came to discover that this beautiful country that lies on the crossroads of history borrowed a lot but also gave the world much of its own. Weaving – the geometrical patterns the women wove so exquisitely on the camel saddles, patterns inside the yurts, on bags to store grains, on rugs, on their clothes, their wedding trousseau – was done using cotton or camel wool. With the introduction of silk, this changed. 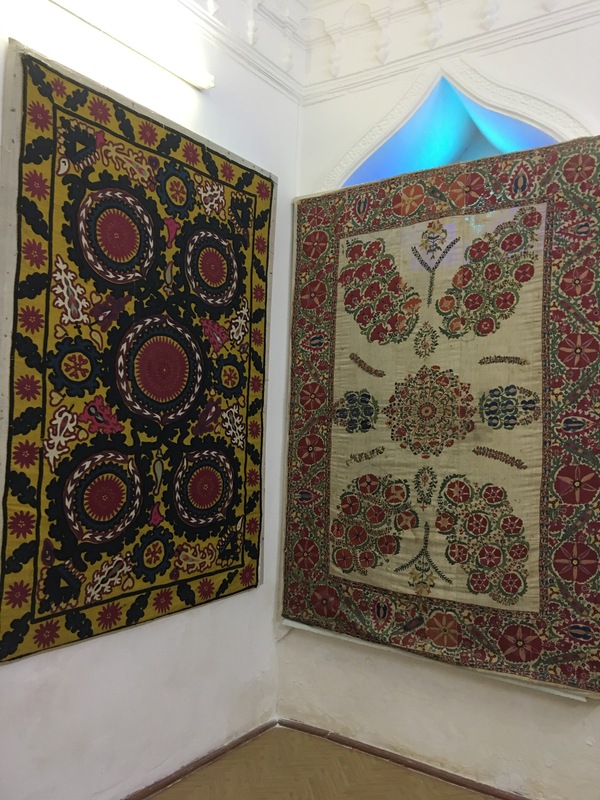 We now have carpets made from silk, thanks to the Uzbeki art of weaving combined with silk from China. Incidentally, the Uzbeks learned carpet making from Turkmenistan, which was a part of Bukhara khanate in the past. In the carpet gallery located in Bukhara I noticed Turkmen carpets which had medallions; Chinese carpets were more muted in colour and had dragons. Carpets from Uzbekistan had patterns resembling sheep. The most mesmerising were the carpets woven by the fire worshipers. Fiery red in colour, they were created by the tribes to remind them of the fire god. There was Bukhara print as well as other influences including Buddhist and Christian beliefs. Ikat – Ikat is a loom I was surprised to find in Uzbekistan. 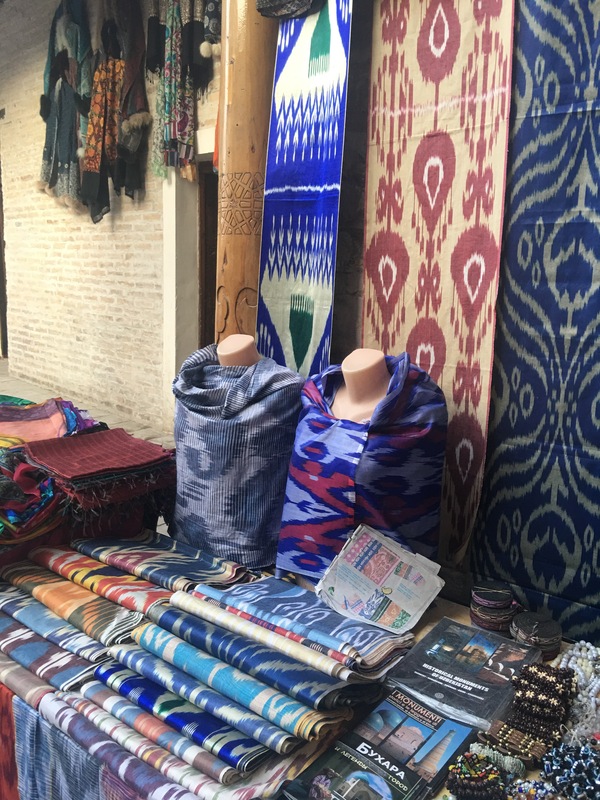 Ikat could have possibly made its way to Uzbekistan from India or via Malaya and Indonesia when the Maritime Silk Route was established. Uzbeki methods of preparing dyes is its own; with silk from China, the two were combined to develop its own Ikat loom. Ikat was worn widely by members of royalty and denoted high status in the society. Porcelain – Pottery is one of the most primitive, yet advanced form of civilisation. I saw a number of artefacts excavated which went to prove that pottery was used for storage. With the influence of the Arabs (or it could be Persians as they used glazed tiles for their mosques) the Uzbeks started glazing their earthern ware. Experts in metal casting, they prepared dyes using iron for red, cobalt for blue, copper for yellow, a mixture of iron and cobalt for black so on and so forth to glaze their pottery. Silversmithing – The jewellery was among the most elaborate I have ever seen. Women adorned jewellery for at least up to a year and even afterwards. Reason being, if for any reason, their husband would divorce his wife, she can walk out with the jewellery she had on her. Anything that was stored in her wedding chest was not hers. Women wore at least 10kgs of Jewellery at a time, some even more. Every village had a jeweller who was a gifted silversmith. He was paid in grains, cattle or through other ways (never money). I saw a lot of silver work – those from Turkmenistan were tribal and clunky. In Bukhara I saw a lot of intricate filigree work, similar to what I have seen in India. It is possible that jewellers learned this form of silver smithing from ancient Greeks who perfected it between 6th to 3rd century B.C. Tea – Uzbeks drink a lot of tea. Choyxona can be seen everywhere. They drink both black and green tea, but prefer the latter. Just like the Chinese, they drink it with their meals. 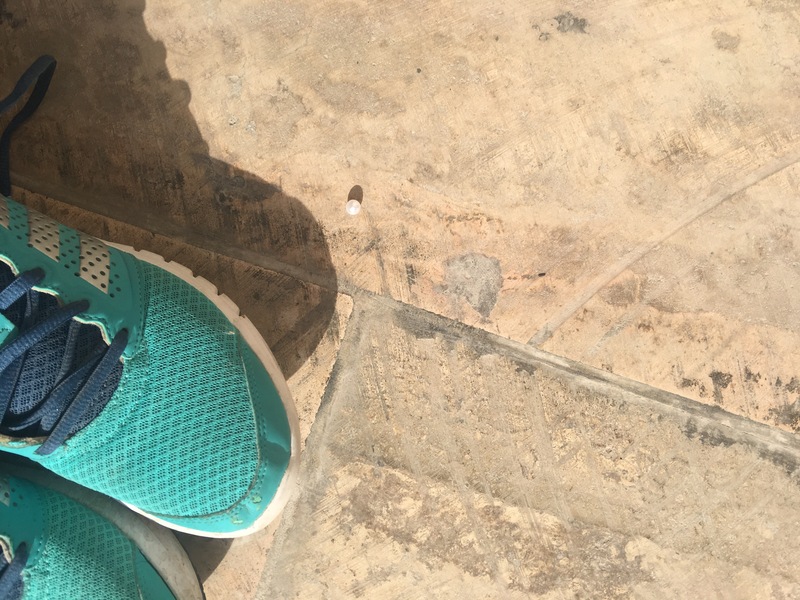 Albeit being unauthentic, they also have tea with spices (like in India), tea with lemon and tea with mint (like in Morocco or Jordan) to add an creative twist to their daily fix. 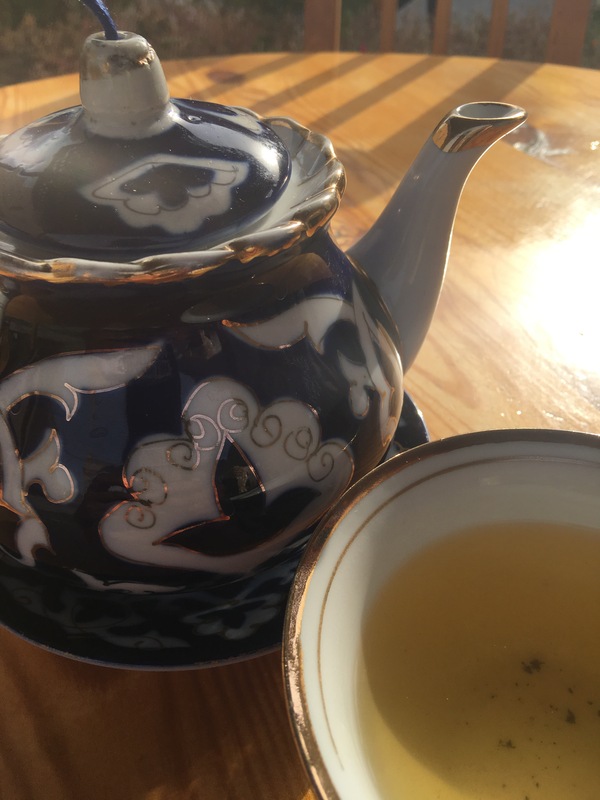 They have coffee too, similar to the Turkish style, sometimes adding cardamom to it, but it is their love for tea that gives the Silk Route such a special place in the history. 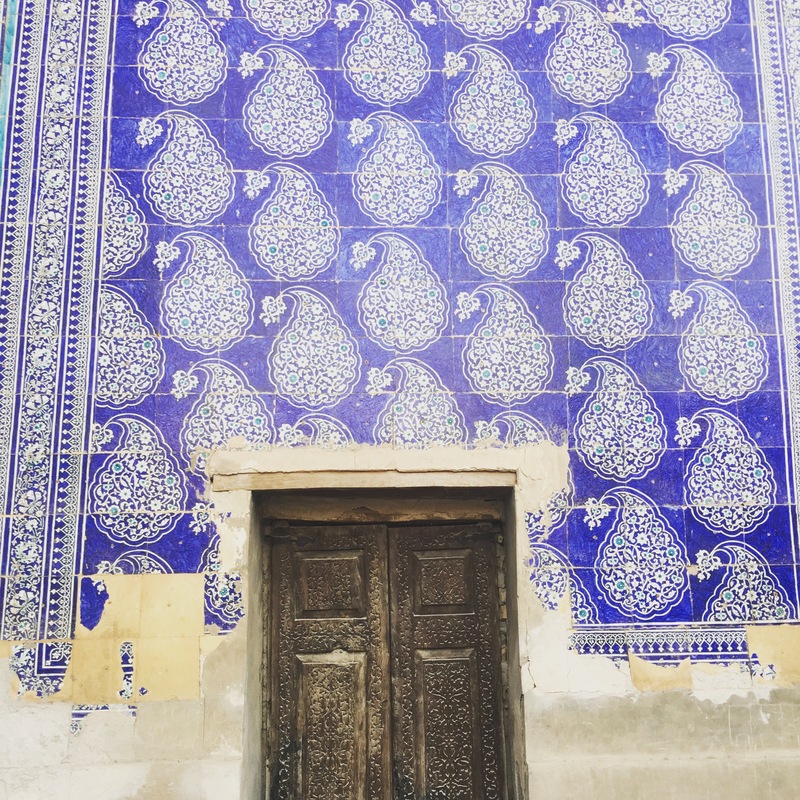 Tile work – probably connects with porcelain work mentioned above but the reason to mention this separately is because they pride themselves in creating intricate tile work, second only to Iran. Uzbekistan has the largest number of archeological buildings I was told – some 4000 – more than any other country. Their blue tile work is callled “Majolica” and is a technique they have borrowed from Mallorca. Their turquoise most likely is from Iran, which has influenced the country greatly in its architecture, ancient script and spread of Islam. Woodcraft – An amazing amount of patience goes into learning and creating wood work that uses no nails in the making. Collapsible nuts and dry fruit holders, plates, book stands with 10 different positions, jewellery boxes, mirrors, bowls, artful objects for home – the wood smiths are bent over on their crafting table measuring, cutting, chiseling, sanding, painting and glazing their work. 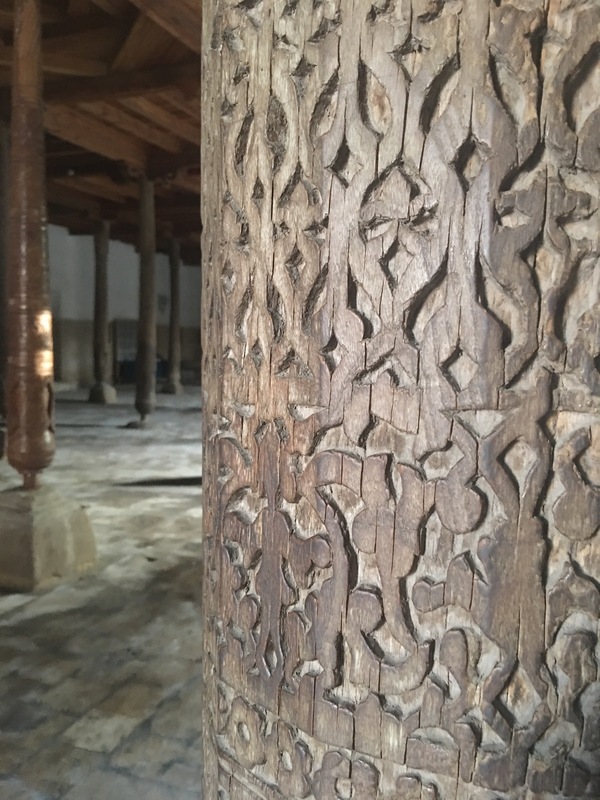 I have seen woodwork in India which resembles woodwork from Uzbekistan, indicating there was an exchange of skill via the Silk Route. Miniature art – Probably something that came from Persia and practiced and perfected by the Uzbeks. Microscopically precise, yet evocative in their illustration, miniature painting is widely used when writing the holy Quran, poems and manuscripts, illustrations – the most popular being the love tale of Layla and Majnun and scenes from the courtroom. Embroidery – an art that was practiced just until the turn of the century and lost to the mass produced clothes coming out of powerlooms and factories. 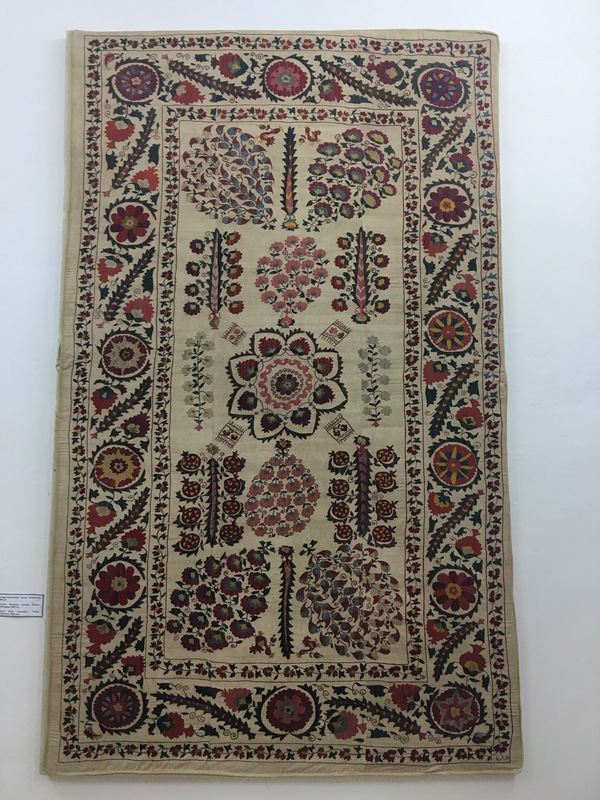 The Suzanis embroidered by the womenfolk are of artistic quality comprising complex stitches and in harmonious colours featuring patterns from the nature that is passed on from generation to generation. It’s art of gold embroidery called “zarduzi” has found its way from Persia to India. Music – Stringed instruments of Tanbur comes from the Greek Tambouras. It was adopted by the Arabs and called Tanbur and is used in Turkish as well as Uzbek music. This came to be known as Tanpura in India. Dutar, a shepherd’s musical instrument, used catgut. With the opening of Silk Road, musicians used silk threads in its place. Rubab, a lute from Afghanistan has found a place in Uzbek music. 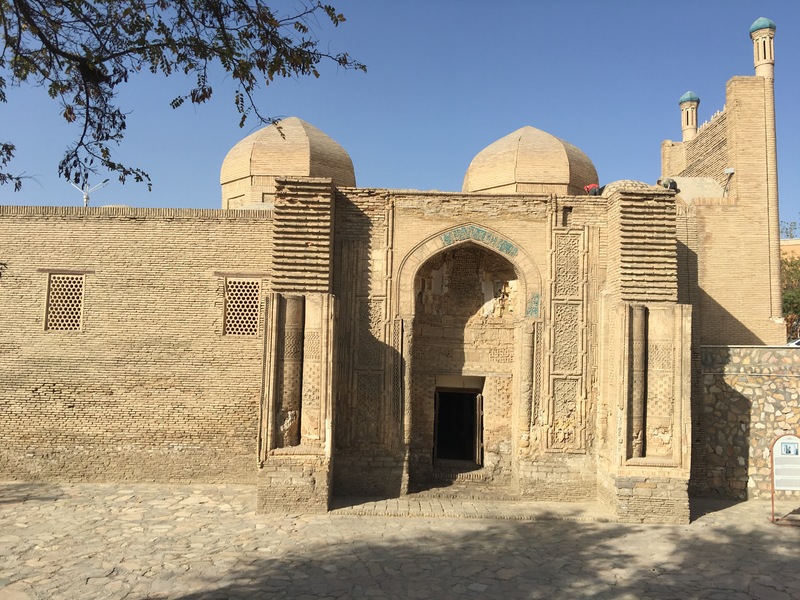 Religion – Uzbekistan borrowed Zoroastrianism and Buddhism before Islam came to the land. From the Russians, came Orthodox Christianity. 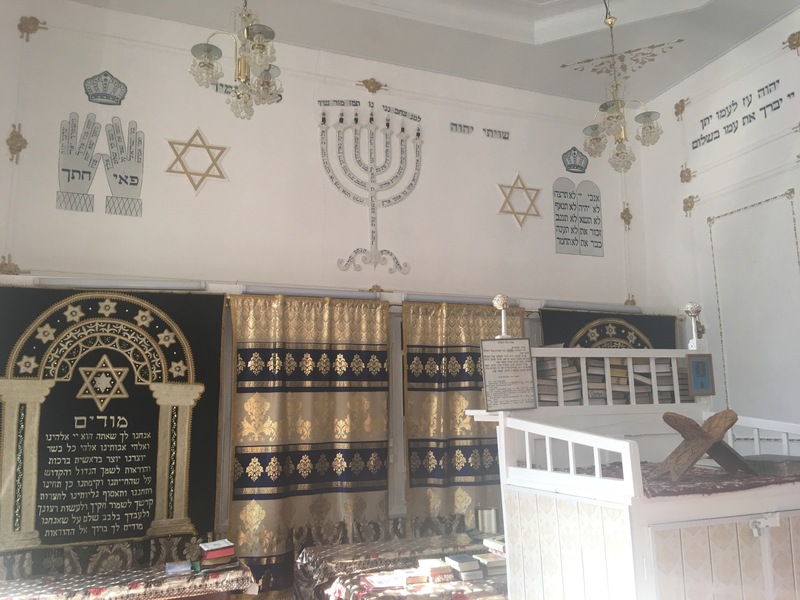 They still have a small Jewish community who live in Bukhara. Although they share borders with Afghanistan and were strongly influenced by Persia, they remain moderately Muslim, following the same path as Turkey. Women do not wear hijabs nor do men wear long beard. Architecture – I was always amazed how Islamic architecture in India had organic representations of fruits, flowers and vines. The beautiful Taj Mahal is a great example. Typically, Islamic architecture comprises geometrical patterns in perfect symmetry. But in India, all Islamic architecture is organic. 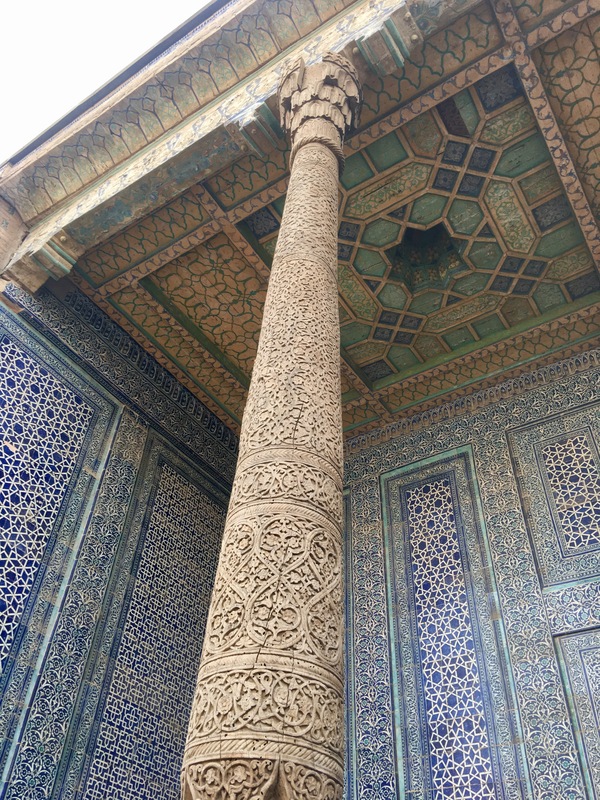 I found the answer in Uzbekistan where I saw a strong assimilation of geometric and organic patterns. With nature being so abundant here, it is but natural that it influenced architecture too, and quite possibly, the organic representation via architecture made its way in India too. All of my guides would eagerly compare the Taj Mahal with the mausoleums in Uzbekistan. And why not. After all, when Shah Jahan built Taj Mahal for his wife Mumtaz, he commissioned builders from Samarkand and Bukhara to construct the mausoleum.